In 1949 the young projectionist at the Picture Palace Cinema on Dale Road, Harry Salt, stepped out onto the cinema's balcony at 11.12 a.m. to take this picture. The precise time the photo was taken is recorded on the clock above Evans jewellers. Harry had taught himself to develop and print his own films and this was one of his earliest efforts. 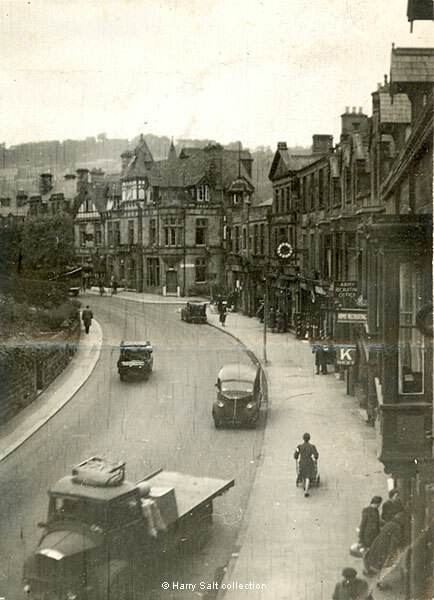 It provides us with a good view of what used to be the Old English Hotel, the large Victorian Gothic building on the corner of Dale Road and the Derwent Avenue/Old English Road junction. Hunter's Stores was on the opposite corner. The Army Recruitment Office, with two signs, was run by Sergeant Steel[e]. A sign for K Shoes can also been seen, slightly closer to the camera. In the 1950s this shoe shop installed a ground breaking (for the time) X-ray machine for checking the fit of shoes. 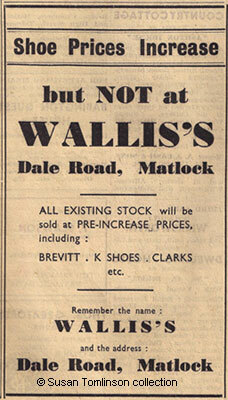 When the first shops on Firs Parade were built the shoe shop (Wallis's) moved away from Dale Road. The vehicles' number plates are impossible to read. The small truck bottom left was an L.M.S. delivery vehicle and was almost certainly driven by either Reg Gedney or Herbert Henry Goodall. They were the only drivers working out of Matlock Station at that time. Matlock Mercury, 7 July 1951. 1. Photo and information supplied by and copyright Harry Salt . Image scanned and repaired by Ann Andrews.